Spring has sprung! I like spring, it's warm and sunny, but it is also muddy and wet. Time for new rain boots, soccer cleats, and a rain coat. 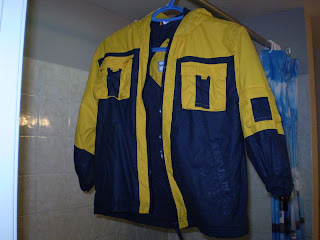 I got this nice waterproof coat at a new local non-profit thrift shop I am helping to run at my job. It is called Venture Treasures. It is a thrift shop designed to have people with disabilities have meaningful work, community inclusion and integration as well as a source of revenue for the organisation. I am so proud to be a part of this "Venture" not only because it is such a worthy cause, but, yes, because of the amazing deals!! All of the items donated are priced well below other local thrift stores because we want this stuff to move. We have limited storage space. As an employee, I get first peeks at stuff, though I still buy during regular store hours from another employee to keep things fair. This rain jacket, which I bought for my son for the season, was an absolute steal! I saw similar, new ones in the Walmart flyer for 25 dollars. I guess that is not such a bad price for a new coat that a kid will probably outgrow by spring's end. I prefer my price, however, which was...get this, FIFTY CENTS! Oh yeah! Once I washed it and used a sharpie to write my son's name in the collar, you'd never know this coat was used. The kid before probably only wore it a few months too! I figure that saves me $24.50 to use on other stuff. Did I mention I love getting deals? I'm sure you'll all be hearing more about Venture Treasures and my Deals of the Day.